The training program offered by the Division of Nephrology, Hypertension and Transplantation is fully accredited by the Accreditation Council for Graduate Medical Education. Clinical fellows are exposed to an active diagnostic and treatment service drawing from 548 beds in Shands Hospital and 433 beds in the adjacent Gainesville Veterans Affairs Medical Center. The clinical rotations are designed to emphasize the diagnosis and management of renal disease, fluid and electrolyte disorders and hypertension. Over 100 diagnostic renal biopsies are performed over the course of a year, providing extensive experience in biopsy interpretation.A particularly strong aspect of our training program is the extensive one-on-one interaction fellows enjoy with the faculty in both the clinical and laboratory setting. This interaction is strengthened by the commitment of the faculty to excellence in teaching. Each applicant should have completed, or plan to complete, three years of internal medicine training (internship plus two years of residency) and be board eligible or board certified in internal medicine prior to beginning the fellowship. 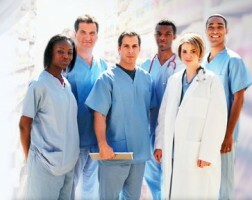 Individuals interested in a fellowship position should apply through the AAMC ERAS system. Evaluation of applicants is based upon the application, academic and clinical training record, letters of recommendation and a personal interview. The division supports an active transplant program that performs over 150 kidney transplants each year. Fellows participate fully in the inpatient and outpatient post-operative management of the transplanted patient. 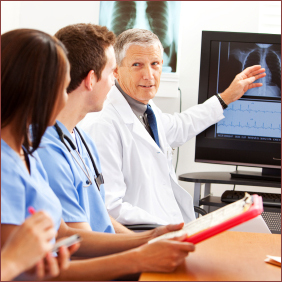 An extremely active and varied outpatient experience is included as part of the clinical training program. This experience includes participation in clinics at the Veterans Affairs Medical Center and Shands Hospital. Following the first year of training, extensive experience in clinical investigation is offered in several disciplines, including transplantation, dialysis, hypertension and general clinical nephrology. Current clinical research projects include treatment of transplant rejection, development of new techniques for mass clearance adsorption in the treatment of autoimmune diseases, and investigation of the nutritional requirements of dialysis patients. In addition, the University of Florida is participating in a multicenter clinical trial, sponsored by the National Institutes of Health, to determine the optimum anti-hypertensive drug regimen to slow the progression of renal failure in African-Americans with hypertensive nephrosclerosis. The hemodialysis program provides fellows with the opportunity to manage acute renal failure using a variety of techniques including hemodialysis, hemofiltration, peritoneal dialysis, CAVH, CAVHD, CVVH and CVVH-D.
A large outpatient hemodialysis population provides practical experience in the management of patients with end-stage renal disease requiring dialysis. A chronic ambulatory peritoneal dialysis program provides additional experience in the treatment of end-stage renal disease. 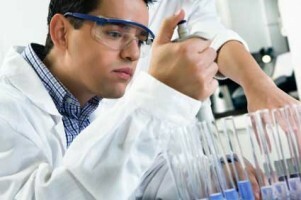 Fellows are also offered the opportunity to obtain research experience in one of several laboratories in the division. The faculty offer extensive research training in renal physiology, cell biology, renal pathology, transplantation immunology, molecular biology and biochemistry, hypertension and related disciplines. There is also active collaboration currently in areas of mutual interest between members of the division and faculty in the departments of pharmacology, biochemistry and molecular biology, pathology, physiology and medicinal chemistry, and fellows have the opportunity to participate in these activities. The division offers an accredited training program in transplant nephrology. This is a 12-month program accredited by the American Society of Transplantation (AST) Transplant Nephrology Fellowship Training Accreditation Program. In order to participate in the program, individuals must have completed a nephrology fellowship program and be board-eligible or board certified in nephrology. The educational program consists of six months clinical service on the inpatient kidney & pancreas transplant service. The remaining months include dedicated research time, outpatient clinical work as well as training in transplant pathology and in the HLA lab. The fellow is expected to participate in one or more scholarly research projects, and will also participate in teaching residents and general nephrology fellows. We encourage attendance and presentation of research at national transplant meetings, including the American Society of Transplantation Fellows’ Symposium, and the American Transplant Congress. Interested applicants should have completed, or plan to complete nephrology fellowship training and be board eligible or certified in nephrology.